When Charlie Miller makes a decision, he acts. That explains why a phone call from Stover Animal Control spurred him into action. He quit — yes, quit — his job and went to adopt Winston, a West Highland Terrier he saw on Petfinder. Initially, an elderly woman had relinquished the dog to the shelter because she could no longer care for him. By the time Charlie inquired about him, the Westie had been adopted. Charlie was disappointed, so when he got the phone call saying Winston was back at the shelter because he hadn’t gotten along with the adopters’ other dog, Charlie dropped everything, including the job, and headed to Stover, MO, which is about four hours from his home in the St. Louis area. Winston and Reba hang out in the back yard. Winston is very bonded to Charlie. He follows him around, and if Charlie leaves the house, the little Westie sits by the window until he returns. He also protects Charlie, warning off anyone he, Winston, doesn’t know from coming too close. But he’s independent, too, and shows this side of his personality when he goes into the fenced backyard, which Charlie says is normally immaculate. “I let Winston out. I go out 20 or 30 minutes later. There are 18 holes dug in the yard. And I mean holes!” — the kind you stumble over. He also brings gifts into the house for Charlie — live snakes as well as several other critters he has caught and dispatched unceremoniously. No matter. This is his fur kid. 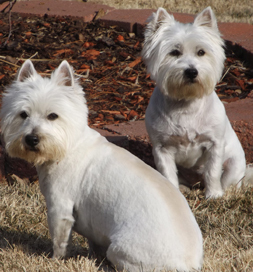 Since adopting Winston, Charlie has added another Westie, Reba, to the family. She was found abandoned in the country with matted hair and covered with ticks. When Charlie heard about her, he promptly went to get her. But this time, he says, he didn’t have to quit his job to do it.